This topic was published by DevynCJohnson and viewed 1186 times since " July 28, 2015 @ 06:00UTC ". The last page revision was " October 30, 2015 @ 11:22EDT ". 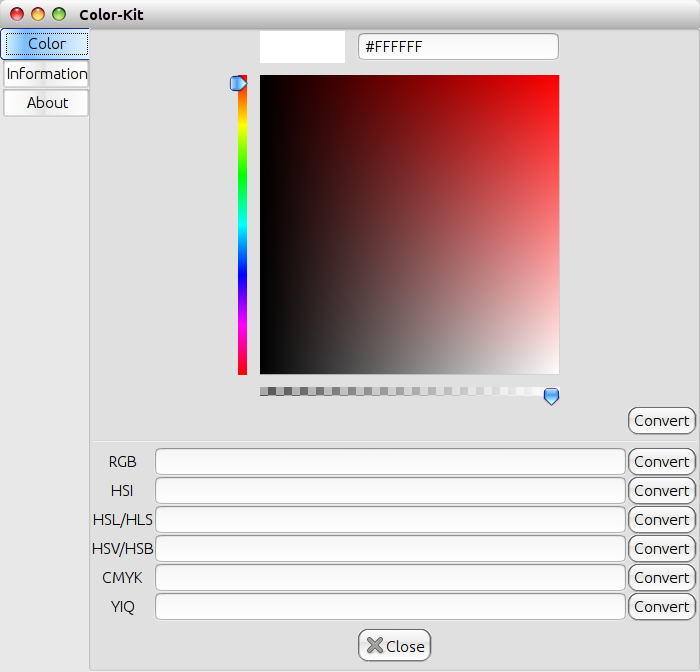 Color-Kit is a GTK3 (GUI) program that converts between the different color-spaces. This software is licensed under the LGPLv3 license (https://www.gnu.org/licenses/lgpl.html). Color-Kit was created by Devyn Collier Johnson <DevynCJohnson@Gmail.com>. Please consider donating to this website for further development. NOTE: On some systems, users may need to resize the window to trigger the GTK widgets to refresh/redraw.